·	Efficiency and effectiveness are different dimensions of nutrient use efficiency (NUE). A system level assessments of NUE can be made using a partial nutrient balance (N removed in grain/N applied) and partial factor productivity (grain produced/N applied). What are your numbers? In developing a N management strategy, these tactical issues need to be considered but within the general approach of a soundly based and regularly reviewed N budget. Making and reviewing yield estimates is critical, as the yield potential will be a function of the N demand in our rain fed environments. The budget should include N supplied from the soil as profile N plus in-crop mineralisation, as well as the efficiency with which the nutrient gets to the product – termed nitrogen use efficiency (NUE). What do efficiency and effective use mean? While the term NUE seems simple, there are many ways it can be assessed. There are differences in the numerator and denominator of the equation, as well as the temporal and spatial scale adopted. Some of the more common terms are explained in Table 1. Some such as Apparent Recovery Efficiency or Agronomic Efficiency rely on having a nil fertilizer control, which makes them less suited to paddock or regional scale and more suited to experimental comparisons. Alone, none of these indicators are of particular value, but Partial Factor Productivity (PFP) helps understand the return in grain from the use of fertilizer, while Partial Nutrient Balance (PNB) tells something of the source of the nutrients removed in the crop. In terms of fertilizers, PFP tells us about effective nutrient use, while PFP tells use about efficient nutrient use. Both can be assessed at paddock or farm scale, and do give some idea of two long term NUE measures that can be used to assess system level performance, much in the same way growers and advisors are comfortable using water use efficiency (WUE) for the same purpose. For example a grower who produces a 1000 t of 11% protein wheat using 40 t of urea has a PFP of 55 kg grain/kg N applied and PNB of 1.1 kg N removed/kg N applied. = Y/F = (Y0/F) 40-80 kg/kg: >60 in well managed systems, at low N use or at low soil N supply. = (Ug-U0g)/F (grain only) 0.3 to 0.5 kg/kg; 0.5 to 0.8 in well managed systems, at low N use level or at low soil N supply. = (Y-Y0)/(U-U0) 40 to 60 kg/kg; >50 in well-managed systems, at low N use level or at low soil N supply. = (Y/U) 30 to 90 kg/kg; 55 to 65 is the optimal range for balanced nutrition at high yield levels. = (Y-Y0)/F = RE x PE 10 to 30 kg/kg; >25 in well managed systems, at low N use or at low soil N supply. Y=crop yield with applied nutrients; Y0=crop yield with no applied nutrients; F=fertilizer applied; U=plant nutrient uptake of above ground biomass at maturity; U0=plant uptake with zero fertilizer; Ug=grain nutrient content with applied nutrients; U0g=grain nutrient content with no applied nutrients. Table 1 also shows the mean PFP and PNB estimates for Australian cereal production systems. Both values should be considered because a high PFP with a low PNB indicates that the high productivity is drawing on soil N reserves rather than fertilizers. Alternatively, a very high PNB (>1) with a low PFP suggests that losses of nutrients are occurring. In our farming systems, growers may have very high PFP and PNB because they rely on soil reserves (say N from a pasture ley) to sustain productivity. These indicators, like WUE, can help understand something of the system efficiency for farmers, but the interpretation is far more important than the numbers themselves. The most efficient way to use fertilizers is not to use any, but that is not effective as production is likely to be nutrient limited. Using the above metrics can be useful in looking at broad-scale efficiency, but at a crop level, grain protein can be an estimate of the degree of N limitation a crop has undergone. Proving grain size is good, wheat grain protein concentration generally has a strong inverse relationship with grain yield but with increasing N supply yield and protein converge (Figure 1). This relationship has a large genetic component so some varieties express higher levels than others, and the response is also affected by rainfall/water supply particularly after anthesis. The earlier N is applied, the larger the yield increase, while the later the N is supplied, the larger t the protein increase. Basically, the N supplied will most affect the tissue that is actively growing at that time. Early N N stimulates shoots or tillers, while later N can increase stem growth. 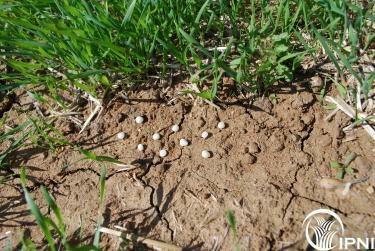 Once active stem growth slows, later N can be used in grain filling. Table 2 shows the results of a small experiment where 20 kg N/ha was applied as urea at different times to a wheat crop at Horsham. The later applications gave progressively smaller yield responses, while the protein response increased except when applied during early dough. This also shows that the 20 kg N applied showed lower recovery as application delayed. 2. Unless springs are good to very good, there will be little benefit from N applied later than booting, and much of this will be as a protein response.